In jet boats, inboards or outboards drive high pressure pumps. Water is sucked into the pump and then expelled in a powerful jet from the back of the boat. Jet boats are most easy to operate at high speeds. Smaller jet boats can be operated in very shallow water. Effects to Chinook salmon may include juveniles being sucked into the inlet. Adults can be disturbed or hit on the spawning grounds. Effects on habitats may include salmon redds or spawning dunes being disturbed by the jet. 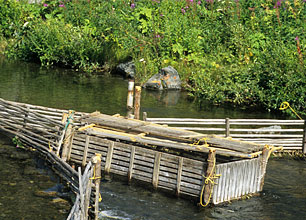 Effects to salmon or habitat will be greatest during spring low water or during low water years.